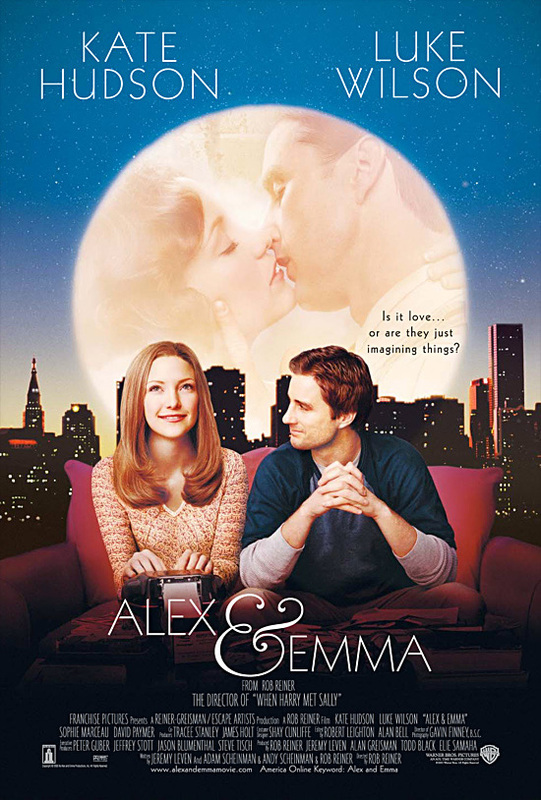 Cinecultist has been seeing these ads for a new Kate Hudson/Luke Wilson picture, called Alex & Emma, that feels a bit like deja vu. In said film, opening June 20, Wilson plays Alex a novelist in trouble with the mafia who must finish his book in 30 days. He hires stenographer, Emma, to help him type the story he dictates but of course she's fiesty and stuff so her personality influences the characters and the story. Along the way the actors play both the imagined characters in the novel and the writers in various fantasy sequences. In the end, they fall in love. This story sounded quite like an Audrey Hepburn movie, where Audrey plays a typist helping William Holden finish a screenplay where the actors play both themselves and the characters in the fantasy sequences from the resulting fictional movie. CC went to look it up on trusty IMDb, who informed us the movie is called Paris When It Sizzles, from 1964. On the official website, Alex and Emma's screenwriters, Jeremy Leven, Adam Scheinman and Andy Scheinman say the story idea came from Dosteovsky having to finish The Gambler in 30 days under threat from the mob and in the process falling for his typist. Dosteovsky, hmm? Any Russian lit experts out there who can confirm or deny this story?